Well, it actually happened… the follow-up to My Bloody Valentine’s “Loveless” – released in 1991 and given a questionable remastering last year – is finally available. Nearly twenty-two years later, with no further warning than an aside by Kevin Shields at a recent Brixton Academy gig in which he replied to a lairy fan’s heckle about the likelihood of a new MBV platter within the forseeable future with a shouting of “two or three days!”, something jumped upon by the digital music press. After all, after such a long wait – the hysteria which greeted The Stone Roses’ tardy follow-up “The Second Coming” soon turned to disappointment when it failed to live up to the lofty heights of its eponymous predecessor. 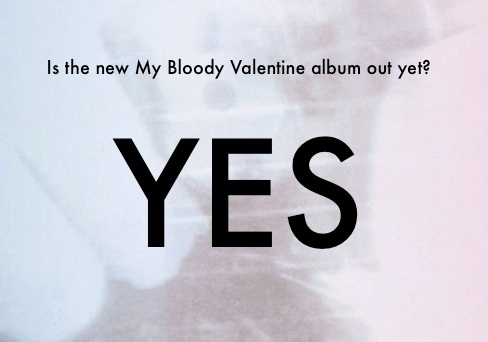 And maybe it if this reference point we need to re-visit, to compare to the second coming (or the third coming, as “mbv” is – of course – the band’s third album “proper” when compendiums and reissues are ignored) of “My Bloody” (I distinctively recall annoying fans yelling “MY BLOODY! !” at the quartet’s memorable Rollercoaster gigs alongside Dinosaur Jr., The Jesus and Mary Chain and a pre-mega-fame Blur) especially when Madchester’s most infamous quartet (note I did say Madchester, not Manchester’s… obviously too many contenders for THAT title) rolled back into town for a series of triumphant reunion gigs last year. Because, whereas the five years idled away between debut and (WARNING: irritating US music journalist word ahead) sophomore album the Roses built up an anticipation that couldn’t possibly be quenched by any album, by letting over an ENTIRE GENERATION go by between one much-loved (can I say “groundbreaking” yet?) 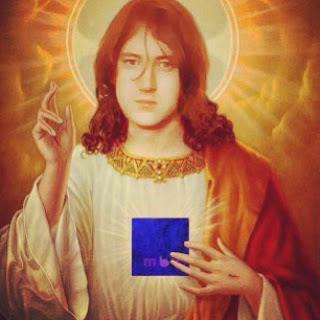 album and the next – supposedly bankrupting Creation in his quest for a perfect sonic palette along the way – Kevin Shields replaced any possible whinges of “is THIS it?” with gasps of amazement that the album was actually being delivered at all. And as The Stone Roses themselves saw when their surprisingly successful return (I mean critically, any Roses reunion was obviously bound to be a star-studded sell-out) a real long absence really does make the heart grow fonder. Like anyone who remembers the hazy crazy days of shoegaze in the early 1990s with half an eye on the internets, I watched the build-up to the “album drop” on Twitter. In real time. Will it, won’t it… some people were floating the idea that midnight Saturday/Sunday would be as good a time as any, a bit like when the megastores (RIP) used to open at midnight for the new Madonna album or whatever, and sure enough at the stroke of midnight mybloodyvalentine.org sprung into life. Or rather, for most people, it didn’t. Tweets began to fill my timeline that “Kevin Shields has broken the internet” and a few die-hard fans began to whine in a way eerily reminiscent of those let down by the technology when trying to purchase Kraftwerk tickets a few weeks previously. I managed to get on to the site after refreshing lord-knows-how-many times, when it crashed as soon as I clicked a button. Then I saw the album had been uploaded to YouTube… and then I decided to call it a night. But next morning Mary Anne Hobbes blasted a medley of the whole album over the BBC 6Music airwaves and I knew that I had to purchase it, and preferably on vinyl as mp3 probably wouldn’t do 22 years of sonic tweaking justice. 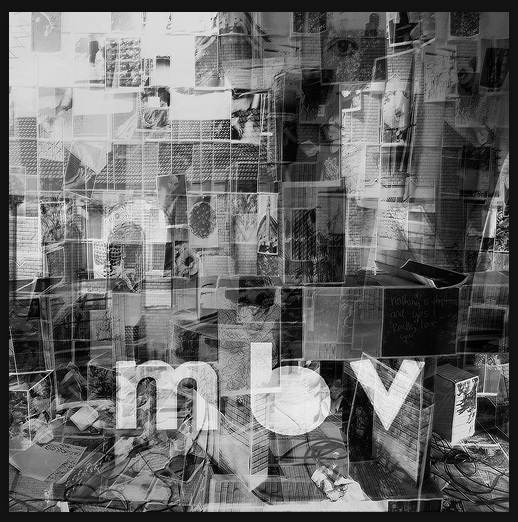 Plus there was an LP + CD + download bundle option available on the now smooth-running MBV site, and the word LIMITED alongside the vinyl details. I punched my info in and am still awaiting my package. Let’s hope it doesn’t take another 22-odd years to arrive… after all this is the band whose last recorded effort as a quartet was a cover of “We Have All The Time In The World“. I was going to do a track-by-track rundown of the mbv album (lower-case letters please) that has been on the iPod for around a whole week now but seeing that both Ned Raggett from The Quietus and Alexis Petridis from The Guardian have penned far greater reviews of this exhilarating long-player than this humble servant could ever hope to, you can read theirs instead (he said lazily). Nonetheless, my enthusiasm for “mbv” hasn’t been dimmed by a week of exposure, and although it is hardly a quantum leap from the intoxicating fuzz we fell in love with last time, the general standard of daytime-radio-friendly pop music has fallen so far (can YOU think of an early 90s irritant comparable to Guetta, Pitbull or the current slew of identikit boybands / urban soundalikes? Even Take Take that were almost bearable by comparison, ffs…) that the enchanting, dreamy, noisy wooze-pop that debatably kick-started “the scene that celebrates itself” (certain Bella Union bosses may beg to differ) was not only greeted with nostalgic glee but also as as breath of fresh air. Yes, the last track has a bit of a vintage drum-n-bass-wig-out edge to it, and in a couple of tracks Bilinda’s vocals are almost transcribable without a second listen, but there’s no doubt this is a My Bloody Valentine record. and a jolly fine one at that. And what do the class of ’91 think of Kev and the gang’s return to our turntables? Emma from Lush tweeted that she “had heard a couple of tracks off YouTube on her “crappy laptop speaker” before proclaiming she was “gonna get the CD. Old school, yes”. Rachel from Slowdive opined – shortly after the album “dropped” – that she was “drowning in mbv”, and subsequently concurred with a follower that the album was “rather good” and that she “wouldn’t expect anything less”. Charlatan and sometime coffee man Tim Burgess described the album as “epic… loudly epic”, while David Gedge, the Ralf Hütter of The Wedding Present (and author of this post’s title, as you had probably spotted), protested he had “not had the chance yet” to hear the aforesaid recording and Boo Radley Martin Carr claimed to have been almost knocked down by a bus as he cycled home, enraptured by “mbv” on the headphones. Meanwhile, from the world of football, Basque-born Spanish internationals past and present Gaizka Mendieta and Xabi Alonso both tweeted My Bloody Valentine related-links, with “only tomorrow” being a favourite of the Madridista. One Spanish tweeter pondered that if Xabi were allowed first dibs on the Real Madrid changing room sound system their unfortunate league trajectory could probably be dramatically reversed thanks to the power of MBV riffs. To conclude, I would add that you could do a lot worse than investing in a hard copy of “mvb”, preferably on vinyl, or failing that on CD. And when the package finally arrives… PLAY IT LOUD.